Todd being offered a deal on a trail bike. Melissa is worried what his Aunt Bev will say. Christina and Melanie are discussing Kelvin Stubbs. Melanie says she is over him and already has another date lined up with a client from the corporation. Melanie tells Christina she plans to top up her tan by doing some sunbathing in the garden. Eddie walks in and comments that it is his lucky day as there is nobody around but two beautiful women and him. With that Harold pops his head around “I'm here if you don't mind”. Eddie asks Christina and Melanie if he can join them. It seems they don't actually know him so Harold introduces him as Eddie Buckingham from England and that he is staying with him for a while. 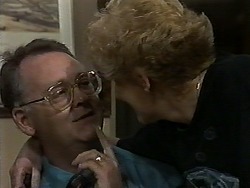 Harold thinks it is good that Eddie is meeting new people instead of hanging round with him and Madge. Melanie tells Eddie about her break up; he thinks the guy must have been mad to dump her. Melanie starts laughing – Yes that laugh!! Eddie tells her she obviously has a great sense of humour. Melanie invites Eddie over to have dinner with her and the twins. Eddie is intrigued that Christina has a twin “I can't imagine there being someone as gorgeous as you”. Eddies one condition is that he does the cooking; Melanie agrees. Harold tells them he is closing up but just has time to call Melanie over. It seems Eddie has a special crepe recipe and Harold wants her to get it off him. Melanie agrees on the condition that she gets free coffees for a week. Todd is trying out his new bike. He is asking Josh, Melanie and Cody for ideas where to hide it. Melanie tells him he should have thought of that before he bought it. Ryan comes along and says that he can hide it under his house. Melissa still thinks someone will find it. Christina is rubbing suntan lotion into Melanie's back. Christina suggests undoing her bra strap so she doesn't end up with a line. They begin to discuss Eddie. Melanie looks up and can see a light shining in the tree; she thinks that someone is watching them. She informs Christina that there have been reports of a peeping tom in the area but Christina tells her not to worry about it. Cody, Josh, Melissa and Todd are discussing the upcoming Easter holidays. Cody says that they can get a lot of rides in. Jim comes in and asks how the horse riding went; he is curious as to why they are all so dirty. Cody tells him that they fell off a lot! Todd says that he hates lying and yet again Melissa says that someone will find out eventually. Eddie is packing his ingredients for crepes into a bag. 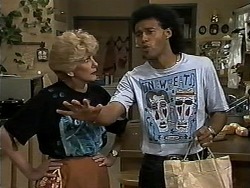 Madge asks about the secret ingredients but he is keeping quiet. Harold comes in with a camera; he has just taken a picture of Jim rummaging through the bin. Jim comes in after him and tells him he isn't happy and that he was just recycling. 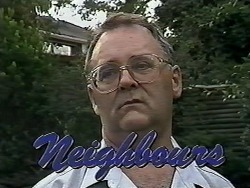 Harold tells him he was up a tree taking a picture of a bird and managed to capture Jim too. Jim wants the picture and negative when he gets it developed! The girls are complementing Eddie on his cooking. Melanie tells him she was very impressed with the vegetarian crepes. Eddie quickly works out what she is up to and that she is trying to get the recipe for Harold. Melanie tells him that he has a very suspicious mind. Christina asks Melanie about her date on Saturday. 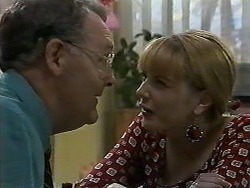 Eddie tries it on but Melanie tells him she is after an older man. Caroline and Christina aren't fussy though. Melanie tells Caroline about the ‘peeping Tom' Eddie winds her up by telling her it's normally the people you least expect who end up having a drawer full of dirty photographs. Eddie asks both Christina and Caroline out on Saturday night. Christina and Caroline are making coffee. They are discussing Eddie. Caroline tells pretty quickly that Christina likes Eddie. The guys are trail biking. Todd suggests that Melissa has a go; she isn't keen but gets on the bike. Melissa falls off soon after, but it seems Todd is more concerned for the bike than for her. Melissa tells him that she is fine; she is upset that he cares more about the bike though. Eddie comes to the door. He thinks that Caroline is Christina; she goes along with this though. She tells Eddie that she wishes ‘Caroline' wasn't going with them on Saturday, and she suggests that they go out somewhere alone. Melanie sees the flashing light in the trees again. Melissa is fed up. Todd suggests she has another go on the bike; she tells him NO!! Harold is being ordered down a tree by a policeman. He tries to explain that he was photographing a bird! Melanie is disgusted with him. The policeman asks Harold to accompany him to the station.